Back in the DEEP PURPLE FOREVER days things happened fast and I used to do interviews with people in the Deep Purple Family on a regular basis. 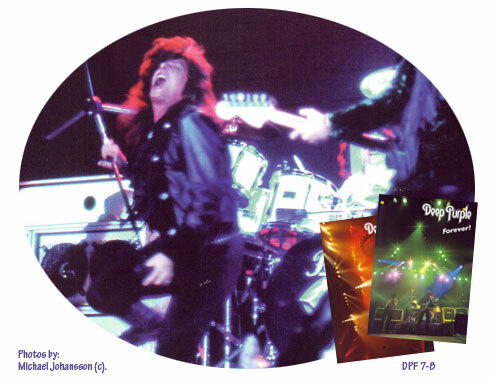 These two chats with Joe Lynn Turner was made over the phone in February and November 1993 and saw print in DEEP PURPLE FOREVER (issues 7 and 8). I have to say that Joe Lynn Turner was a very decent chap for allowing me to call him at home. Looking back on this stuff, it really is like a postcard from 1993. Enjoy! Photos, including magazine covers, by Michael Johansson – many thanks! February 27 1993 – Joe is out in the cold, the rock business is at an all time low. He is slowly finding his way back, and the will to carry on. Here is the chat we had that day. Your girlfriend told me, as we set up this interview a few days ago, that you were in chilly Buffalo and played a gig with CPR. How many concerts are we talking about? – Oh, this is something that I am doing just because it is so much fun. I am doing seven or eight shows with them. Just clubs. Al Petrelli is a friend so when he asked me if I wanted to do it I said yes. It was a great deal of fun. I talked with Glenn Hughes recently and he said that after his blues album he wants to do his own thing now, which is of course funk and soul type stuff. Would you consider to make such an extreme move yourself musically and if you did what would the music in question be about? – I am glad for Glenn´s sake if he moves in that direction now because I know that that is what he has always wanted to do more than anything else. So that must be good for him. I have early influences myself, like Otis Redding, Marvin Gaye and Wilfred Pickett. It would be great fun to visit those early roots someday but at the moment I think I have three options, blues, hard rock and commercial pop & rock. So what are you up to and what do you think is going to be your next move? – Right now I am in a period in which the most important thing is to write strong new songs. That is my aim and it is what I am doing right now. I may put a band together and do some club gigs around April as the Joe Lynn Turner Band. It is nearly impossible to get a record deal in the traditional way in America now but if it happens it happens. Somebody might discover us? I would really enjoy to do a few festivals over in Europe as well if that came up. Just to meet the people and to get the profile up a bit. If we come over I want everybody to know that I am going to perform Deep Purple and Rainbow songs live, maybe even some Malmsteen stuff. That would be great fun. I think that people would enjoy to hear for instance some of the old Rainbow songs again. – I believe so. Nobody else is playing them, or have for a number of years. I did “Highway Star” with CPR the other night and the audience just loved it. We also did “I Wish” by Stevie Wonder, Hendrix “Little Wing” and “Superstition”. If you record a new solo album, how would it be different from the one that you did in the mid eighties? – Probably very much different. First of all, I don´t work with the same people today as I did then. I doubt that I would do a lot of covers either. Not even by my earliest influences, I think that Michael Bolton has done enough of that (laughs). Yngwie Malmsteen was quoted in a major Swedish newspaper recently. He said that the reason that you did not re-join his band is that you are “mad”. – He called me mad? Well, I guess he may have issues. The last time we spoke I tried to say, between the lines, why I didn´t want to work with him again. But if he behaves like this I hardly think that I have to be tactful anymore. The truth is, I didn´t feel that his personality had evolved very much since the last time that I saw him, and I told him as much. He may well think that everybody that doesn´t want to work with him is “mad”. I don´t know, but what does that tell you about him? Have you been in touch with Deep Purples manager Bruce Payne since the split? – Yes, I have heard that they are doing some mixes over in Los Angeles. One of the songs that Ritchie and I wrote are supposedly on the record, but I don´t know which one. Apparently, Ritchie liked it so much that he didn´t want to drop it. Wouldn´t it be great if they released a second album with yourself, consisting of the left over tracks and some live material from Singapore? Or maybe the very first jam, the version of “Hey Joe” that was recorded the minute you stepped into the room on your first audition? – Yes, that would be great, but I really doubt that they will even consider such a release in a while. Certainly not until after the new record is out. Obviously they wouldn´t want anything to clash with the current situation. But yes, the opportunity exists and I wouldn´t be too surprised if they released a posthumous album some day. Are you in contact with John Norum at the moment? – His new album is coming out here in the States now and I think that he would be interested in having me help him out with a few concerts here to promote it. But I am not sure if the timing is right, the plans should have been drawn up last year and not now. Are you aware that people are saying that your health is not what it could be and that this is why Deep Purple fired you and also why you have not been visible in Europe for a while? – What are you saying? This is so typical! This is how the media works, if you don´t have a high profile at the moment they start to make things up instead. I don´t want to make any interviews until I have something to say, to sell. I am healthy and I am working on new material. I will be more than happy to do a lot of interviews later on when I think that the time is right. I would be glad to get a few interviews organised here in Sweden for you at that time Joe. – I appreciate that. We can talk more about that later on. I´ll talk to everybody that wants to talk to me, no problem. – Rob Fodder, Ritchie´s personal assistant, called me up the other day. I know that Ritchie was in the same room. He said “Ritchie has got nothing but respect for you”. I thought that it was a little strange that Ritchie would contact me right after his split with Deep Purple, I admit that. So you know about all the talk that is in full swing about the break up of Purple now? – I have heard some, I have heard that Ritchie thought that he had major problems with Ian Gillan. I think there may be three sides to this story, the bands version, Ritchie´s version and then the truth! Is it possible that Blackmore did the album with Gillan and the tour although he didn´t want to… maybe he just wanted out? – That could well be true. Rob told me that when Gillan came in they told him not to scream so much and to add a more bluesy feel to the vocals for what became “The Battle Rages On”. I don´t think that Ritchie wanted to work with Gillan again. I think that the others may well have gotten together on the side and then they pushed me out to have a chance to get Gillan back. So if this was a bit of a palace coup, then this may go back in time to when you were asked to leave? – Isn´t that a very interesting theory? I have absolutely no reason to defend Ritchie but I think that he felt that he had to go along. They had already gotten the money and spent some so they must have felt that they had to go on. But I really don´t understand why Ritchie refused to go to Japan. I think that the band showing up without him is going to shock them. What do you think about a Deep Purple without Ritchie Blackmore? – That would be strange. As long as he is in the band it will definitely work as far as the songwriting goes. I never saw Jon Lord present an idea. Ian Paice is more interested in the money than he is of the musical end result. Roger could come up with some good ideas. I don´t know, they did manage to carry on once before with Tommy Bolin, but that was back in the heyday. I think that Ritchie felt that he kind of had to carry the whole thing on his own shoulders. That the others kind of made a good living on his work. When he quit, maybe that was his way of saying “Screw you, I don´t need you!”. Maybe he has wanted to do something different for a long time? – I think that may well be true. I read an interview with him in a paper recently and in it he said that he considered to put Rainbow back together again. If he calls me I will let you know. That would be good fun and ofcourse it is up to you if you ever want to work with him again or not. What else is going on? What is happening with Mother´s Army? – The album is out in Japan and it is doing very well. I am trying to get it out in other parts of the world right now. I will talk to a major company about this next week. Other than that my priority lies with the Joe Lynn Turner Band, or the Joe Lunn Turner All Star Band that we may call it if we take it out on the road. We are in fact doing a gig every now and then. This has grown from something that really wasn´t all that serious to start with and we have done shows in Philadelphia, Detroit, a few in Long Island were Ritchie lives, and New Jersey. Everything that we have done has been within a five hour drive from home. This is happening basically because the people seem to really enjoy it. Are we talking about the band as before, with Al Petrelli and so on? – We actually replaced him recently. He got a break with a band called Widowmaker. Our new guy is called Karl Cochran and he is a very good player with a good feel for the roots of rock. He is a little bit like Zakk Wylde in that respect. We did a show yesterday and he was great. How is the situation with the record companies in the States? Are they signing up anything but grunge? – I see small signs of change. I think that hard rock will be back in favour again. The people are getting tired of the grunge thing. Sadly, not many that works on the labels in America knows what they are doing now. Most of them are just interested in finding bands that can copy already established bands well. Glenn Hughes told me recently that he believed that it will only take a band like Journey to get a major hit now and it will all come back again. I think so to. I spoke with Glenn over the phone the other day. I like him. Things may change in January. The companies will work with new budgets then. I met a woman yesterday that had bought the Mother´s Army album on import for 40 dollars and that to me is an outrage, it shouldn´t have to be like that. I have co-written four songs for an album that will be out on EMI soon, the band is called Bloodline. It is a band that has been put together by sons from people in bands like The Allman Brothers and The Doors. It is pretty good. As for myself I am trying to get a deal for an album that is going to be commercial sounding, a little like Michael Bolton. So your plate is pretty full Joe? – Yes, and that feels good. Do you know what I have heard? I heard that Ritchie thought about playing my version of “The Battle Rages On” through the loudspeakers before the Deep Purple shows! So when it came down to it, he preferred my version of that album. He felt the disrespect of the others. Towards the end he only communicated with the others through handwritten notes. – That sounds like Ritchie! If he should reform Rainbow, I think that we could do a very good album together. The timing might be pretty good for it to happen. We have to wait and see. Thanks for sharing this documents. Very interesting information. It’s difficult to understant why Blackmore didn’t call Turner for the Stranger in Us All album. Don’t get me wrong, Doogie White did a great job.